“Why is it okay to be scruffy when you’re real?” This is a question Isaac had to answer for class, and in solidarity with the lad, I’m going to try to answer it myself, here. I should start by saying that I haven’t read the book, so if it seems like I’m desperately flailing to sound relevant (to anything), that’s because I am. I would posit, however, that this is the nature of all communication after first grade, and thereby acceptable for the matter at hand. So. “Why is it okay to be scruffy when you’re real?” I believe that not only is it “okay” to be scruffy when you’re real, but that scruffiness is an indicator of reality. And not just an indicator of realness as opposed to imaginariness, but also of realness in contrast to fakeness. Real meaning “actual” as well as real meaning “genuine.” Anything that is too perfect or symmetrical seems plastic and artificial. Something may be perfect in your dreams or your imagination, but when you’re awake and viewing the real thing, you notice flaws and oddities. And these are the aspects that make you know that the object is yours, and these are the things that make the object beautiful in your eyes. Any slight imperfection makes an individual more interesting and appealing, makes it stand out from all others, makes it, in fact, individual. It is hard to love something that is exactly like every other such something in the world. It is hard to even recognize that it is yours. If every car in the world was the same, you might identify yours because of a scrape on the fender or a dent in the bumper. This scruffiness helps you to recognize that the car is yours, and the very state of being yours makes it more appealing than every more perfect car in the world. If every child in the world was identical in mind and body, you might feel a vague affection for all of them. But it’s the child you’ve nursed when they were ill, whose snotty nose you’ve wiped, whose strange thoughts you’ve listened to, that you love with a fierce passion. It’s the child whose dirty face and muddy fingernails you love, because it means they’ve had a good day playing in the yard or climbing trees. Because another definition of “real” is alive, animate, as in “a real boy.” And when you’re alive you’re subject to messiness, illness, and aging. But these things, as manifestations of life and liveliness, become poignant and beautiful. Scruffiness is a sign of change. It’s a sign of growing and living, of adventures and mishaps, of stories to tell. These are the things that make a creature interesting and alive. Mint-condition perfection can only be achieved through stasis and isolation, and few things in life are actually better for being static and alone. Scruffiness is okay when you’re real, because it is both symptom and source of a real love, such as can only be experienced by real people in real time. Scruffiness is vulnerability, it is showing yourself to another when your guard is down and your mask is off, and this rawness and openness is the only possible path to intimacy. Scruffiness is banal and day-to-day. It is tedious and unspecial, but when you share this ordinariness with someone, you become more real, your relationship becomes real. You delight in the habits that you share, and you slowly grow and change together, becoming more real and alive and wrinkled and eccentric and lovely with each passing year. By heaven, you’ll think your love more rare and real than any based on false illusions of perfection. And this is why it is more than okay to be scruffy when you’re real. This was a yummy dinner!! I roasted some thinly sliced potatoes with sage and olive oil. 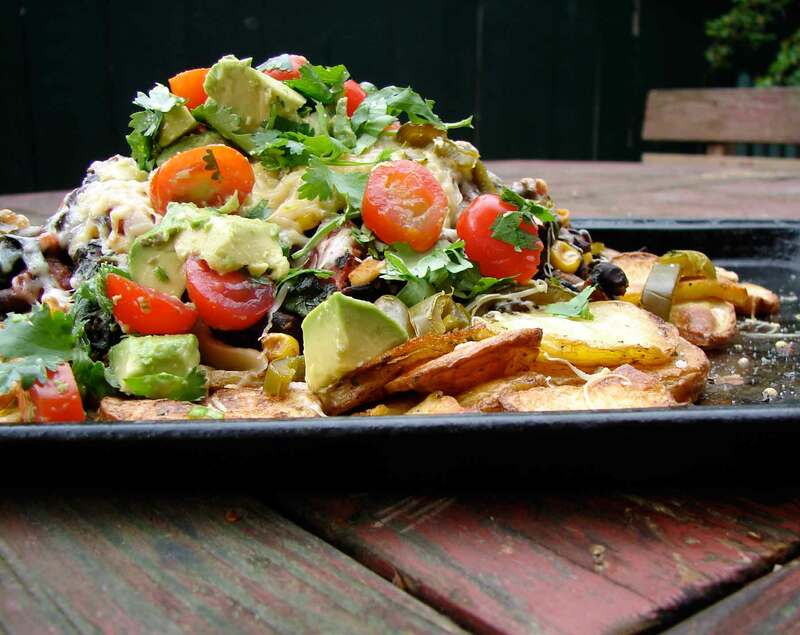 Then I piled them high with roasted mushrooms, black beans, corn and spinach sauteed with chipotle puree, smoked gouda, sharp cheddar, pickled jalapenos and fresh, chunky guacamole made of avocado, tomato, cilantro and lime juice. Smoky, earthy, fresh, satisfying. It was fun to eat this! We ate it like nachos. The boys stuffed the black bean mixture in some soft tortillas. Here’s Linton Kwesi Johnson with Reality Poem. Toss the potato slices with enough olive oil to coat (2 T should do it) and the sage. Spread in an even layer on a large baking sheet and pop in the oven. Cut the mushrooms into 1/4 inch pieces, toss with enough olive oil to coat (maybe 1 T) and the rosemary. Spread in a single layer on a small baking sheet and pop in the oven. In a large skillet over medium heat, warm the olive oil. Add the shallot and garlic and cook for a minute or two until they start to brown. Add the oregano, and then stir in the chipotle puree. Add the black beans, stir and cook for a minute or two. Then add the corn and spinach. Stir and cook till wilted, and add the tomatoes. Cook for five or ten minutes until the spinach is soft and the pan is fairly dry. Put the crispy cooked potato slices on a baking sheet, leaving a small space in the middle. Pile the beans and greens into this. Scatter the roasted mushrooms over the beans. Spread the grated cheese on top, and scatter the jalapenos over the surface. Cook for ten or fifteen minutes (in a 425 oven) until the cheese is melted and browned. Meanwhile, combine the avocado, tomatoes and cilantro. Squeeze the lime juice over, and season with salt and pepper. Spread this cool mixture over the warm beans and cheese. Serve! 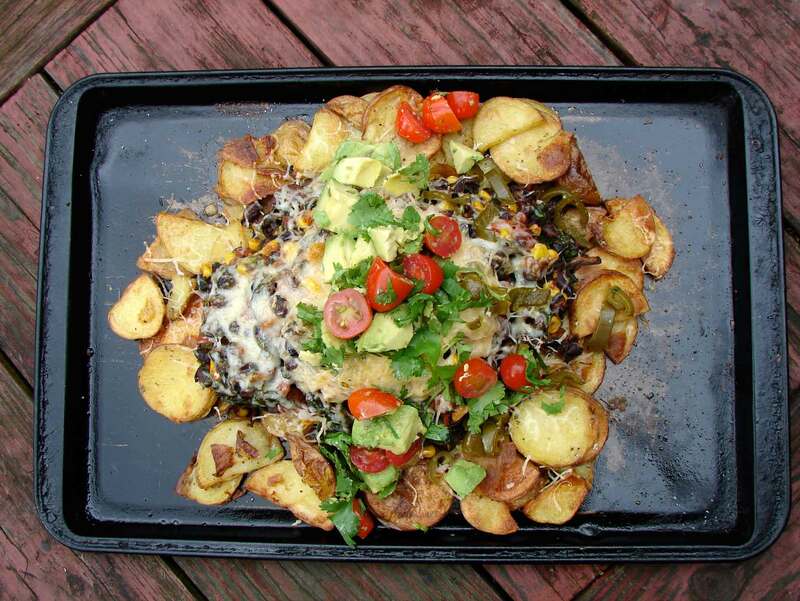 This entry was posted in beans, potatoes, recipe, Uncategorized and tagged beans and greens, chipotle, guacamole, linton kwesi johnson, pickled jalapenos, reality poem, roast potato nachos, smoked gouda by Claire. Bookmark the permalink. Heh heh, me too! I could have kept it much shorter and just said that! I must’ve inherited the scruffy gene 🙂 Also, this dinner looks scrumptious! What are you supposed to do with the mushrooms once they are cooked? D’oh! Did I forget that? You scatter them over the black beans and spinach. Thanks for letting me know I missed a step!